Scientists at the Biomedical Research Foundation of the Academy of Athens (BRFAA) have recently decoded the DNA of the authentic Feta cheese produced in Greece, unlocking its secrets at a molecular level. 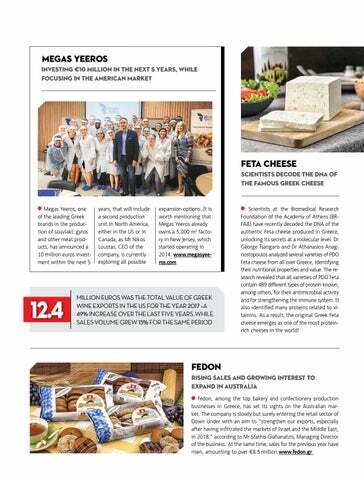 Dr George Tsangaris and Dr Athanasios Anagnostopoulos analyzed several varieties of PDO Feta cheese from all over Greece, identifying their nutritional properties and value. The research revealed that all varieties of PDO Feta contain 489 different types of protein known, among others, for their antimicrobial activity and for strengthening the immune system. It also identified many proteins related to vitamins. As a result, the original Greek Feta cheese emerges as one of the most proteinrich cheeses in the world!